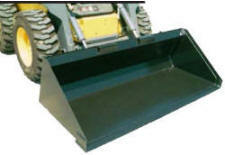 Skid steer buckets can be used for a wide variety of tasks. Low profile duty skid steer buckets are used to haul dirt. Other heavy duty units are made for just for utility work. Agricultural clients have two choices for field work. They can use a model designed especially for spreading fertilizer, and another, similar model for cotton seed. Easy Rack also sells skid steer buckets specifically designed for utility work, and a snow and light material unit for extreme winter conditions in northern climates. Although specialized for different applications, all bucket types can be customized. Heavy duty shanks can be welded to the cutting blade to increase pickup power. These teeth are 2-1/4” across the point and weld straight onto the blade. In heavy duty applications that are extremely demanding, adding a punched blade with bolt-on-blade will increase the life of your skid steer bucket. Users consistently report an increase of up to 3 times the wear when they add this option. Regardless of application, all Easy Rack skid steer buckets share key features that make them some of the most heavy duty skid steer attachments you can use on your construction site. The top of the bucket is called the “hard hat” section because it provides an exceptionally strong reinforcement against rough use and impact. Buckets also feature dual safety stops to make them more controllable, and beveled hard carbon steel side blades to strengthen and protect the bucket sides. Skid steer buckets are further strengthened by seams that are fully welded. The square bottom of each bucket type allows you to back drag the unit over dirt to level it. Scuff bars reinforce the bottom to prevent excessive wear. Skid steer buckets fit almost any loader with a 3/8”, plate steel universal quick tach that is designed to fit a variety of loader brands. All units feature a standard low profile design that allows the operator to see over the leading edge. Other profiles can also be ordered by special request. Talk to an Easy Rack specialist about these options. In some applications, however, standard model type skid steer buckets produce less than desirable results. Because they are solid, they scoop up everything. A new design now makes it possible to actually scoop and sift for certain projects that require only larger materials to be moved. The ribbed-bottom skid steer bucket features an open ribbed bottom that allows dirt and smaller materials (2 ½” or smaller) to fall through the ground without dropping larger materials. Ribbed bottom skid steer buckets are low cost specialty tools that are excellent for virtually any specialized application. Everyone from demolition experts, scrap handling crews, farmers, and construction teams use them extensively. Ribbed-bottom skid steer buckets are rapidly becoming favored tools among landscaping crews because they are ideal for moving rocks. They are also used more and more for sorting masonry materials. Debris cleanup crews prefer ribbed-bottom buckets because they sift out dirt and sand and grab chunks of concrete, boards, and trash more easily. Specifications to note include optional heavy duty teeth, universal quick-tach attachments for quick, secure fit to all modern loaders, and punched blade design for optional bolt-on-blade.